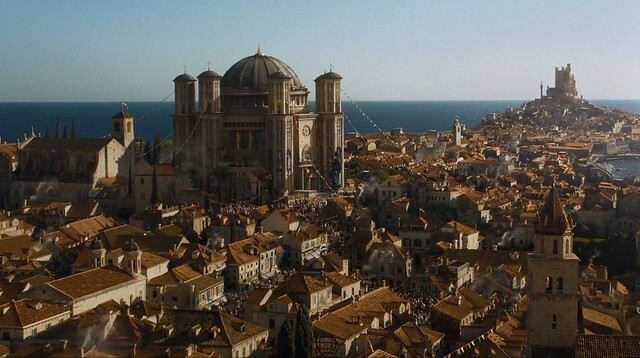 The capital and largest city of the Seven Kingdoms, King's Landing offers many different things within its streets. Who knows what could happen? This is a non-canon thread. Do not post unless you are invited, ty. King’s Landing, the walled city and the home of the Iron Throne. Being in the southern region, it had a nice and enjoyable climate and contained many opportunities for those who could afford it. In one of those places, a marketplace, a man gathered attention on himself. He wasn’t doing anything out of the ordinary, nor was he dressed in a funny way. It was his unusual silver hair that made him stand out in the crowd. But it wasn’t important. Everybody knew who he was and was aware that it was best to keep out of his way. Resting his left hand on top of his sword’s hilt, Rhaegar walked through the narrow streets and made his way to a moderately small square. Looking at the fountain in the center, he stopped and momentarily got lost in his thoughts. In the Square, a merchant was attempting to sell his wares, including goods and tools for construction. shouting of his deals and his excellent goods, his beady eyes peered out through the crowd, searching for someone willing to buy his wares, which, as he often shouted, were being sold at a very modest price. His stall was immaculately clean, and sported a large "T" on the front of it. he sat on a tiny stall behind the stall, sifting through his goods with his hands, which were of a good size. "Of course" replied the stocky merchant, running a hand through his delicate blonde hair, "My name is Domald Tromp and these goods are of the highest quality, I buy them cheap from locals instead of importing them cheap from essos, buying from my stall directly supports our people, the best people, here in Westeros. I have masonry tools, no other tools can help you build a wall quite like these tools, They're from the wall in the north, usesd for repairing broken segments, but they're also just as good at erecting a fantastic new wall to keep unwanted immigrants out of your property." Domald presented an assortment of tools that he had just pulled from underneath his stall, "all of my other products are general needs, rope, firestarting equipment, the odd pouch or clothing, all made here in Westeros by the people, for the people". OOC: Whoa what the hell is this? This is an out-of-character portion I use to give advice concerning the roleplay. As you can see it is easier to get confused with where things are in your post because it's hard to find the quotation marks. What you can do about it is making your character's speech in bold and his thoughts in italic. This makes them clearer. Also using a font of your liking makes your post look nicer. "Fake news, not happening, this is the worst deal, maybe, in the history of mankind" replied Domald Tromp, before kicking over his stall in Rhaegar's direction and grabbing a large hammer with "The Wall" emblazoned on it. OOC: In battle/combat, the best way to counter moves is giving detailed replies. With more details, your opponent has less room to "assume" what you character did. E.g. if I had only said that Rhaegar had slashed, you could easily make it's direction and other unmentioned qualities up on your own. If these information are given by the poster, this counts as GM. If they are not, you are free to assume and make your preferences facts. “I bet you deny the changing climates too. The Starks would love to meet you.” thought Rhaegar while listening to the man’s denial of arrest. Of course, he hadn’t thought he would go down quietly but neither did he expect to see him kick his stall over in his direction. By stepping back and swinging his sword down, he avoided being hit from the wooden stall. Once his eyes were set upon the man again, he was already holding a large hammer in defense. “A hammer against Valyrian steel, eh?” With a grin, Rhaegar slowly increased his speed and dashed towards the blond man. As soon as he was within his reach, he would make a downward diagonal slash across the man’s chest, going from left to right. Domald grasped The Wall with both hands, using the length of the hammer to block the incoming sword blow, before taking a step back and readjusting his grasp on the hammer. Last edited by ElectricalSocketRaccoon; 07-25-2017 at 07:56 AM. OOC: A good thing to do while fighting is using the environment. Of course things like just making stuff appear out of nowhere would be considered out of the line. As Domald blocked his strike with the length of the hammer, Rhaegar felt surprised that his Valyrian steel sword wasn’t able to cut through. It was made of a special material for sure. Perhaps even magic was involved in its making. Hearing his comment afterwards made him laugh. “You clearly haven’t seen winter, lad.” he replied. In his book, only a fool would want the winter to arrive. Seeing him readjust his grip, Rhaegar quickly stepped to his side and moved his right foot to move the dust on the ground. He threw it in the man's face in an attempt to obscure his vision and followed it with a horizontal slash. This time it was aimed at the man’s belly.